BEST-MK 1226 is a one-component, solvent-free, medium strength and medium viscous anaerobically curing adhesive based on di-methacrylate-ester. BEST-MK 1226 is the standard product for securing of threads. It is also recommended for sealing of thread connections, especially for hydraulics. 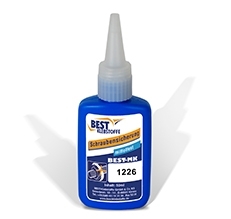 BEST-MK 1226 automatically spreads in the thread without leaking from the thread. The product provides a lubricating effect with the friction coefficient of an oiled screw. Disassembly is possible with special tools without causing damage to the thread.